The Old Canon – RIP. Virtually every photo that I’ve used in the 332 posts I’ve made on this blog since November 2006, has been taken with my trusty Canon Powershot SD400 digital camera. I’ve been carrying it in my thigh pocket, sans case, whenever I’m skiing, through every variation of cold and wet you can imagine, and it’s always worked flawlessly. I’ve considered upgrading, but figured I’d just use it until it died, and that day has finally come. 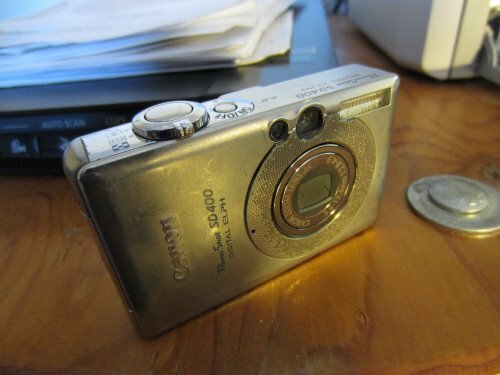 So from this point on I’ll be using my new Canon Elph 300HS, which is close as I could find to the latest incarnation (same battery, same memory card) of my old camera. It’s got a bunch of fancy new features that’ll take me a while to learn, or more likely ignore, but all I really need is for it to be there when I need it on whatever adventures are to come. What a great camera it has been, producing scores of superb shots – but maybe that’s because of the skill of the photographer? nice work with a point and shoot!! !